Bitter Gourd is very good for stomach as it cleans the worms in stomach. However it is very bitter and kids will hate to take it. 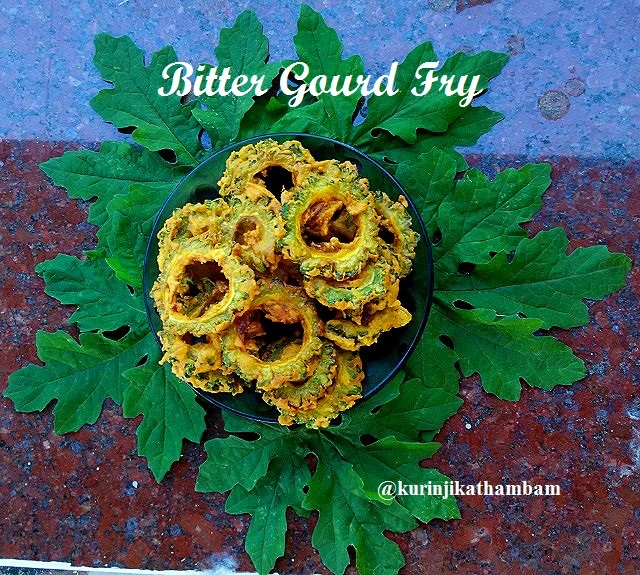 I had earlier posted a recipe (Bitter Gourd Chips) which makes the Bitter Gourd very tasty; This Fry is a variation of that recipe and this can be thought of as Bitter Gourd Bajji. 1. Wash and dry the bitter gourd using the kitchen towel. 2. Cut it into thin circles and remove the seeds from the circles. 3. 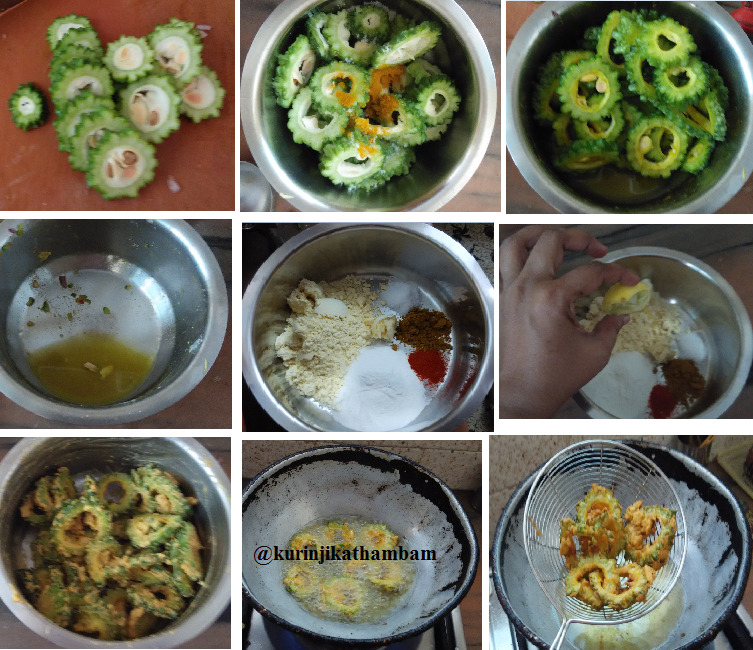 Collect the circle pieces in a bowl, sprinkle salt and turmeric powder. Mix them gently and keep it aside for 15-30 mins. 4. After 15 mins, drain the water collected at the bottom of the bowl. This helps to reduce the bitterness. Otherwise you can use it directly. Skip the step 3 and 4. 5. Take gram flour, rice flour, red chilli powder, coriander powder, ginger garlic paste, lemon juice and salt in a bowl. 6. Mix them gently and sprinkle over the bitter gourd pieces (from 4) , mix them gently and sprinkle water if you need. 7. Then keep it aside for 2 mins. Then heat the oil in a pan for deep fry, sprinkle the bitter gourd rings and fry they become golden color. This fry goes well with rice and is a super evening snack too. 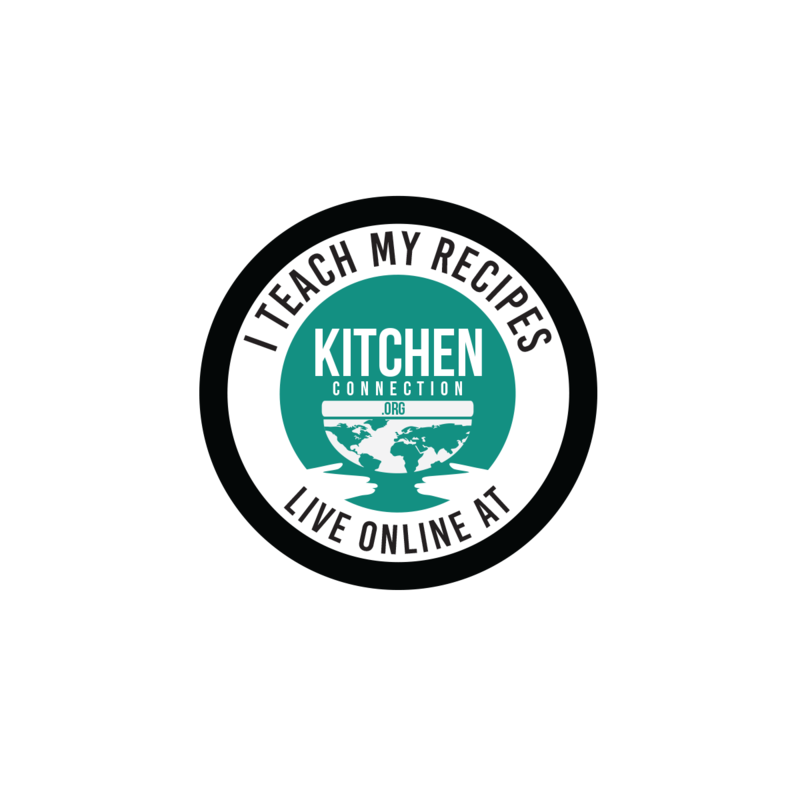 Click here for 30+ poriyal recipes. This fry is awesome. Love to try soon in my home.